Free Fab Stuff: Get Free Samples of Pet Supplies: Dog Food, Cat Litter and More! Get Free Samples of Pet Supplies: Dog Food, Cat Litter and More! Here are some free samples of pet food and cat litter. I bet you're wondering why I decided to post these freebies. My son just got a new pitbull puppy. As if the jack russell and papillon were not enough..lol. So, in honor of Az Portia (he named her after the mean girl in the Mighty Bee's cartoon and some video game superhero) here are some freebies you can get for your pets. Isn't she cute. 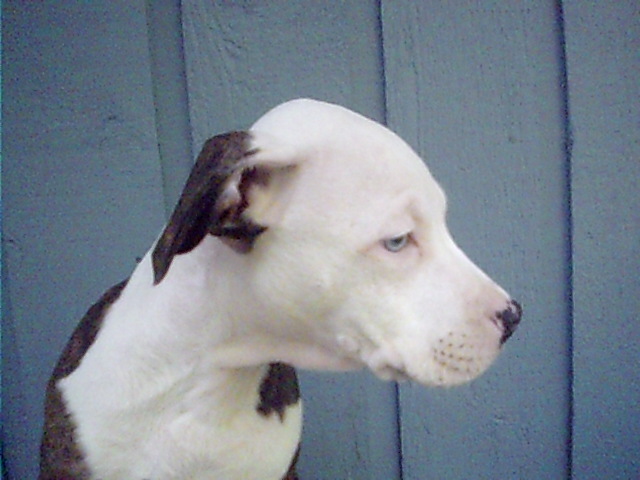 She has blue eyes, a white head and brown body. Free sample of World's Best Cat Litter. Sign up to get a free valuable Milk-Bone Essentials Plus+ coupon. Free sample of Flint River Ranch pet food. Get FREE Pet Treats Samples. Sign up to get a free Iams premium cat food coupon by mail. Fill out the form to get your FREE Sample of Rachel Rays's Nutrish premium dog food.